Great news! 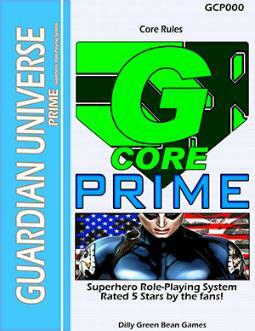 G-Core PRIME is now in PRINT! You can get it over at Amazon.com or any major bookstore chain! G-Core won another Bamfsie for 2015! School Game that so many still adore. Player's Choice Award for 2014! We are considering direct orders under special conditions. nor is it a product of Marvel Comics, but it is 99% compatible with it. now have: Rumble, Agility, Might, Moxie, Smarts, Perception and Spirit. -Simply contact Jay at Dilly Green Bean Games if you are interested. -DGBG reserves the right to deny a 3rd party license.